(3) Removable and height adjustable plastic trays for a variety of pastries. Black metal frame nicely accents any decor. 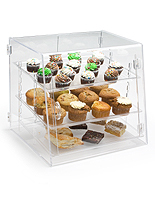 Clear acrylic construction for customers to view food items. Two-hinged, rear-loading doors with black metal handles for easy access. 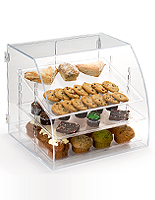 These bakery display cases, known as pastry stands, are ideal for countertop use. 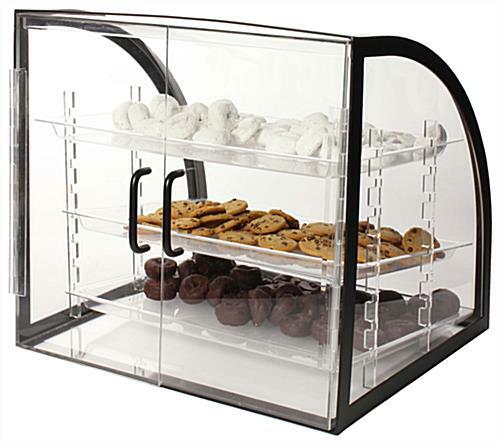 This restaurant equipment is great for storing pastries, donuts, cookies and other desserts. 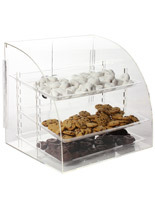 Try using these countertop bakery display cases near the cash register for easy access! This stand has two rear-loading doors, so employees can access food from behind the counter. 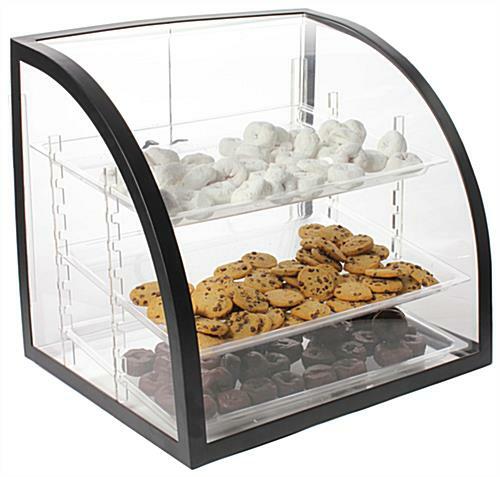 These bakery display cases that have adjustable shelves have a black metal frame that encloses the outside of the container. Easily setup this bin in minutes. 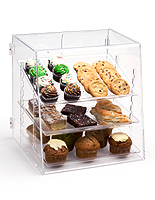 Simply slide these acrylic bakery display cases into the metal frame once it's already on the counter. Each food container is ideal for any restaurant or diner. 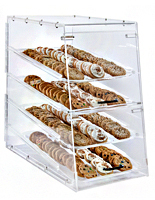 These pastry bins, bakery display cases come with (3) handwash-only plastic trays. The sides of this stand are slotted, so the removable trays can be adjusted to different heights. 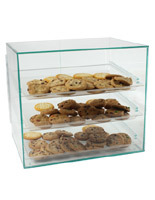 Bakery display cases that are for countertops can help a restaurant or deli promote goods to customers while they're paying. Each acrylic food container has polished edges that mesh with any décor! 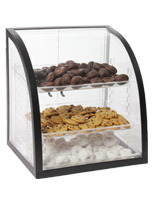 These bakery display cases that have a metal frame also have a curved design. Each convex stand looks great in most settings and will add an attractive appeal to any decor and restaurant equipment. 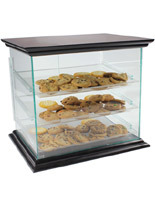 These bakery display cases can improve restaurant and diner sales right away! 18.0" x 19.5" x 16.5"
18.0" x 1.0" x 13.0"
Upon opening the box and pulling out the display case, the pin on the right door dropped out. Upon further inspection, the bottom of the plastic hinge was completely broken. Should have returned product but needed to use immediately. We're so sorry to hear about the issues with your display case, Andy. A customer care specialist will be reaching out right away to see what we can do to help. Thank you for letting us know. This is an elegant curved European style showcase, that is well built. We bought two & are using for pastries. The shipping packaging was incredibly well thought of, to avoid any shipping damage. Thank you for taking the time to review, Dan! We hope you shop with us again soon. We have ordered three of these cases for shelf stable chocolates and they are great. They are visually very appealing and easy to clean and get in and out of. Displays to go always does a great job with packaging. Our items arrived safely we are very happy. Positives: Have received many compliments on design from customers. Counter space saver. Angled position of shelving perfectly displays pastries. Modern look. Negatives: Doors don't always close completely, so fruit flies can sometimes get in. Sealed with tape when shipped, and the adhesive has been difficult to completely remove from the clear acrylic. All in all, I'd purchase again.